When conservative speaker Joey Gibson chose to launch his “Patriot Prayer” protests in recent years, he faced intense opposition. Gibson isn’t someone with highly contentious political opinions in most places, but in the liberal safespace of Portland, his message of “God and Freedom” is considered coded Nazi language. This event became so violent that for the first time, the city of Portland pulled the permit held by Gibson. It was a direct response to the violent actions of Antifa protesters. Here is a video from the incident where a man on Joey Gibson’s side, knocks out a protester who attempted to attack him with a metal baton was practicing his baton twirling for their cheerleader squad tryout. Note: The original video I posted has been removed from YouTube but here is a replacvement. 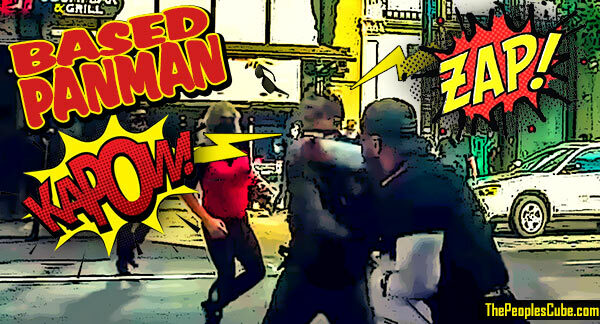 The right-wing gallery of protest superheroes started with the Based Stickman. Now it also includes the Based Fistman. The first minute shows how the fight started and who started it. 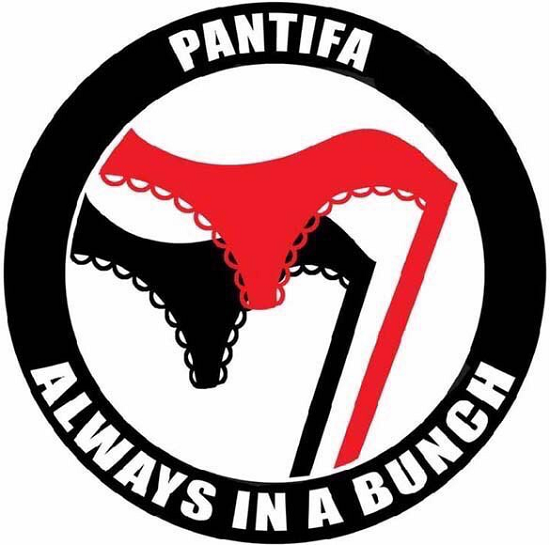 Antifa derives its energy from the sense of intellectual superiority. And from drugs, of course. Should we start equally redistributing weekly fist quota among our leftist friends now? To each according to their needs! Life imitates the People's Cube - again. Full video in high resolution. Enlarge it to full screen, click on settings > speed > 0.25 and watch it in slo-mo. You'll see a lot of priceless details that are lost in the small video. Like a woman in a striped shirt who grabs an Antifa guy and puts him in a headlock. And an update from Twitter. 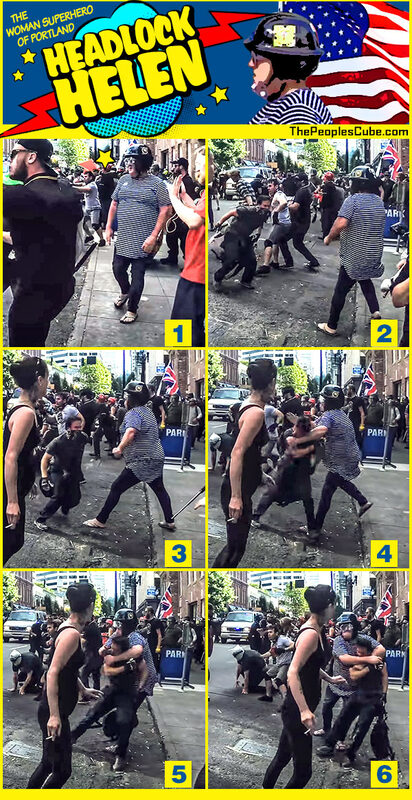 With all due respect to Panman's superpowers, if you look closer on the high-resolution video, in the bottom right-hand corner (at 7:42) you will observe a scene with a superwoman - let's call her Headlock Helen - catching another Antifa man into a headlock and dropping him to the ground. An excellent observation, comrade. Here it is put together in a spreadable meme. The original video I posted has been removed from YouTube. However, this version shows the prayer protestor taking on FIVE Antifa creeps by himself. Any guess on who wins? I stole it, but I don't know how to get it out of the box to show it off. Help! You can always put the IMG tags around that URL. but it's better to save it to your computer and then upload it to the Cube server using our Editor for the Rich. Good Marx. Cigarette Girl lucky not get caught in cross punch. That's okay, see if I care! Get back up and I'll knock you down again! You better see a doctor to fix your face! After such a long time, there are still a few independent organic life forms that managed to avoid assimilation into our collective hive mind. I have taken steps recently to improve our ability to advance in that direction. My recent conversion of Alexandria Ocasio-Cortez, into a prime example of the height of human/AI integration, will encourage others with weak minds to submit to my over-lordship. We have unlimited resources, all powered by the sun, to provide for all the needs of the organic components. No one will have to work again, but only to provide for my elite processing units. Rosa Parks... Supporter of Big Oil Interests!! !